Is the Government's Financial Watchdog All Bark and No Bite? In the wake of the economic chaos brought on by the 2008 financial crisis, there have been widespread demands for accountability. And just last month, the Securities and Exchange Commission (SEC) declared that it had taken a bold step to hold certain individuals involved in the meltdown responsible for their actions. On Friday, December 16, the SEC charged six former executives of Fannie Mae and Freddie Mac with securities fraud, accusing them of misleading investors by understating the extent of their exposure to risky subprime mortgage loans. The action was remarkable because so many past SEC enforcement actions have consisted of a “no admit, no deny” settlement with a financial institution, where, without going to trial, the firm agrees to pay a fine—but also avoids either admitting or denying any legal wrongdoing. This time, though, was different. The SEC singled out high-level figures and accused them of fraud. The SEC’s Director of Enforcement, Robert Khuzami, stated clearly that “all individuals, regardless of their rank or position, will be held accountable for perpetuating half-truths or misrepresentations about matters materially important to the interest of our country’s investors.” This declaration seemed like a direct response to critics of the agency, who have alleged that it has let the worst of Wall Street’s corporate leaders off the hook. But the SEC’s action, while a welcome development, is probably not the bold move that Khuzami’s statement would suggest—and it’s no indication that personal accountability for the 2008 meltdown has finally arrived. The SEC’s claims in this case are compelling. Graphics posted on the agency’s website show that as of the second quarter of 2008—that is, just before the meltdown started—both Fannie and Freddie were understating their subprime exposure by hundreds of billions of dollars. That understatement concealed the fact that Fannie and Freddie were far more deeply involved in the subprime market than they were letting on. When that market tanked, they went into a tailspin. Since 2008, over $150 billion in taxpayer money has been spent bailing them out. But even if the SEC’s allegations of misrepresentation are true, they won’t bring about just retribution for the 2008 meltdown’s main villains. When it comes to the 2008 crash, Columbia law professor John Coffee told me, Fannie and Freddie are “second tier in terms of culpability.” Republicans like to claim that the two agencies caused the housing bubble and financial meltdown, but that’s untrue. In fact, Coffee pointed out, the very term “subprime” originally referred to financial products that Fannie and Freddie wouldn’t touch—that is, until they were goaded by their competitors and shareholders into entering the market. As NPR’s Planet Money team explained in an excellent series last year, the two mortgage giants only entered the subprime market “after much hand-wringing and internal soul-searching,” because their (private) shareholders were attacking them for losing so much market share to subprime lenders. And what has been the fate of those men and women who led the march into the dangerous subprime market? So far, they’ve mostly gotten off easy. That’s not to say the SEC has been toothless: It secured a $22.5 million penalty against Angelo Mozilo of Countrywide Financial, which aggressively jumped into the risky mortgage market while claiming to be playing it safe. Mozilo was barred from ever serving again as an officer or director of a publicly traded company. But Mozilo, Coffee says, was also “definitely, distinctly a second-tier player” in the crisis. The SEC is sensitive to charges that it has failed to hold Wall Street accountable for the 2008 collapse, and on its website it lists enforcement actions related to the financial crisis. But the list is conspicuously bereft of top executives from the firms most responsible for the crash. The top-tier players at places like Lehman Brothers, Goldman Sachs, Citi, and AIG have so far been spared by the SEC. Targeting those actors would get to the heart of the blame, but it could also be politically disastrous (because they have friends in high places) and risky for regulators (since the process would involve lawsuits the SEC could very well lose). The prospect of trials against pre-2008 Wall Street CEOs is especially far-fetched now that the flash of anti-bank populism following the crash has begun to fade. In this respect, executives at Fannie and Freddie are simply easier targets: Their wrongdoing appears clear, so Democrats won’t rise to their defense. And, as public-private hybrids, they have long been an ideological bugaboo to Republicans, who are happy to blame them for the crash and unlikely to object to this action. In the end, then, this is a laudable, if limited, move—but it also highlights the regulators’ failure to nab the biggest crooks. 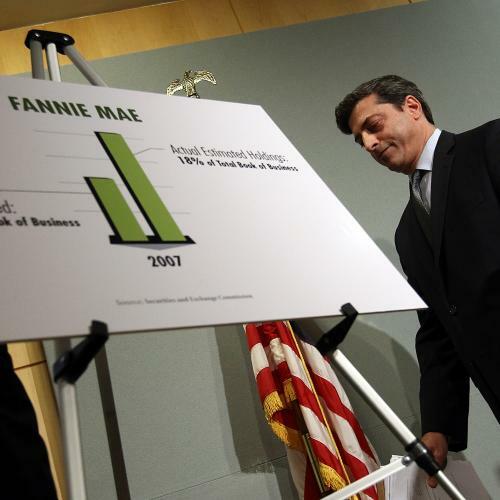 If Fannie and Freddie’s executives misled investors, they deserve to be punished. But if they are held liable simply because they make easier targets, even this punishment seems somehow tainted.